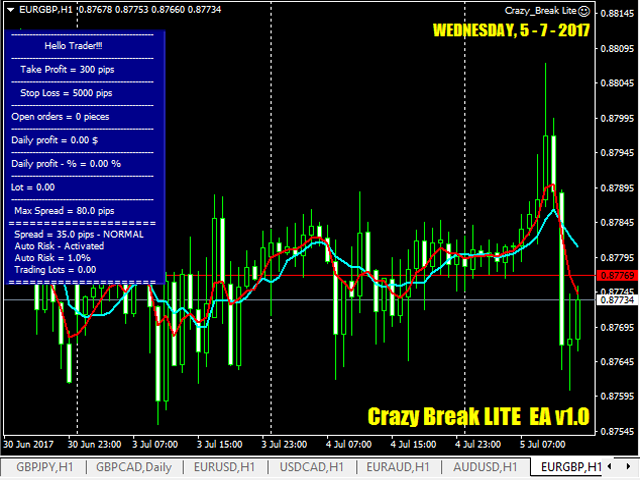 "Crazy Break LITE" is an automated trading Expert Advisor for the Forex market. 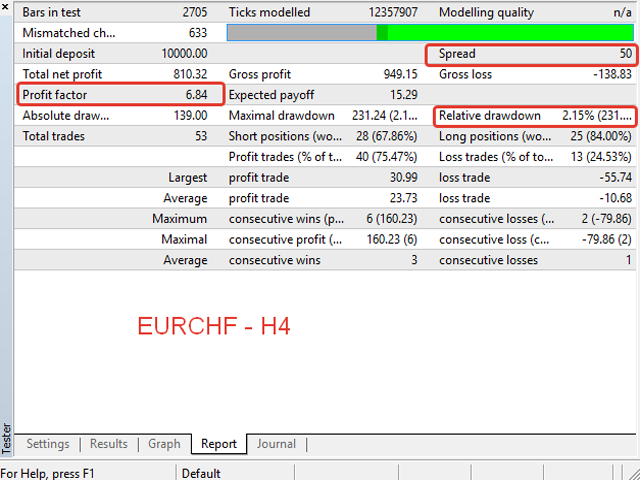 The EA can trade any currency pair on any timeframe. 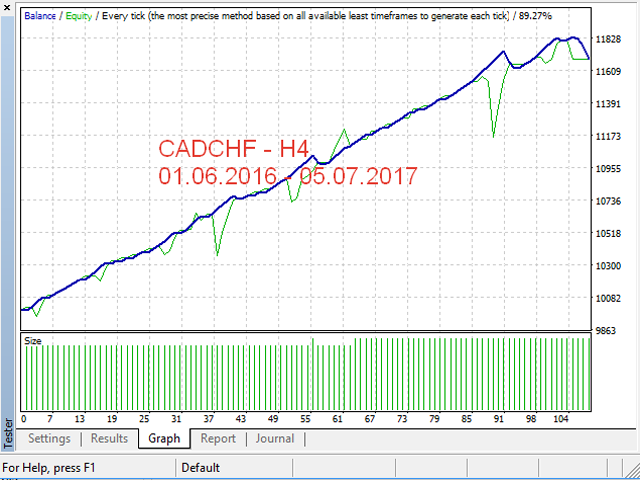 I recommend trading EURCHF, AUDCHF, NZDCHF, AUDCAD, AUDNZD, AUDUSD, CADCHF, EURUSD, NZDCAD, USDCAD, USDCHF. Timeframe Н4. The EA automatically determines the number of decimal places. It does not use indicators for market analysis. It uses my own algorithm to find an optimal entry point and opens an order. If the entry turns out to be wrong, it opens additional orders. 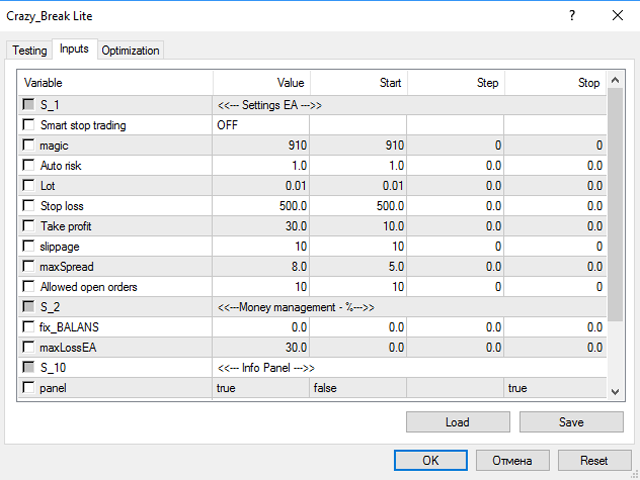 If multiple orders are opened on one currency pair, the EA uses profit averaging on this currency pair. For risk control, be sure to use the "MaxLossEA" function, which can save your deposit in case of force majeure. The value is indicated as a percentage of the current deposit. Example: maxLossEA - 30. 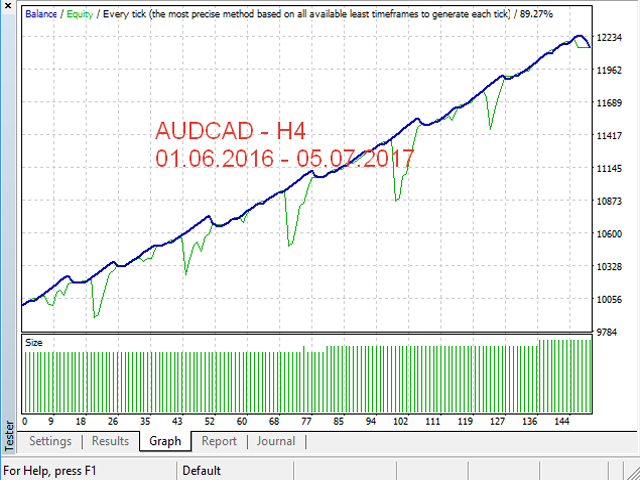 It means that if the drawdown on this currency pair reaches 30% of the deposit, all open orders on this currency pair will be closed. Also use Allowed open orders - the maximum number of open orders. 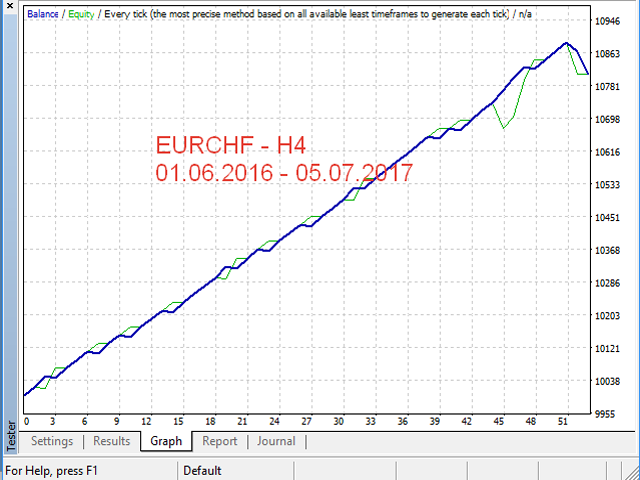 If you set 10, it means that if 10 or more orders are open on the account, no more new grids on other currency pairs will be opened. This helps avoid critical drawdown. 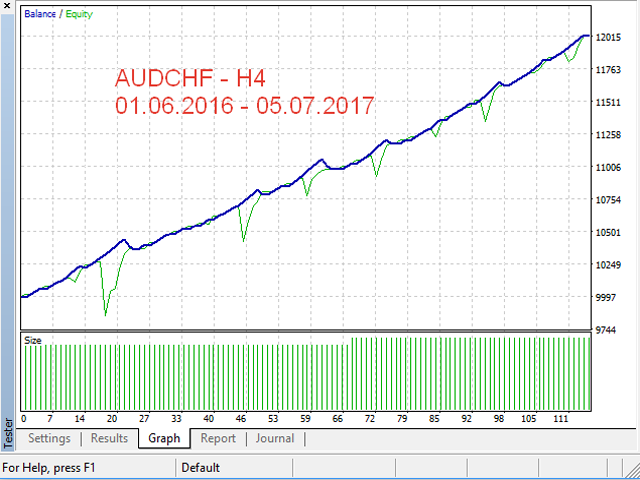 If you need to stop trading, but there is a drawdown on the account, and you do not want to get loss, enable Smart stop trading. 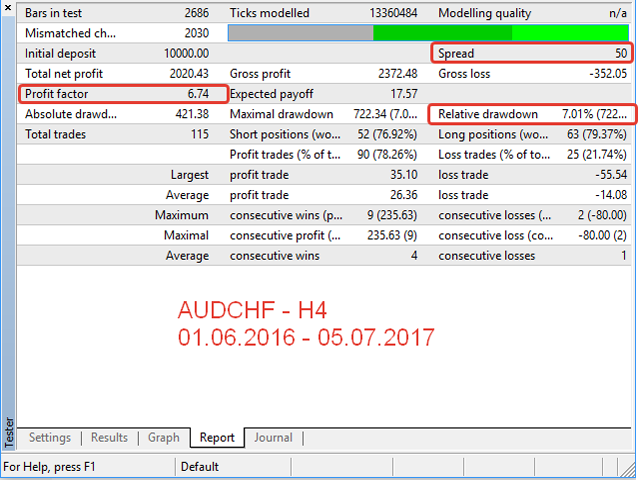 Open orders are traded and closed following a normal algorithm, while new orders will not be opened. This provides a smooth breakeven trading stop. If you have purchased this product, Please leave your feedback and rate the EA. This will be a motivation for the development of new products. Thank you! Smart stop trading - off/on. Disabled by default. If enabled, then if there are open orders on the symbol, additional orders will be opened if necessary, but after closing based on the averaging algorithm, no new orders will be opened. Stop loss - allowed loss level. Indicates in points for four decimal places. For five decimal places, it is automatically calculated. 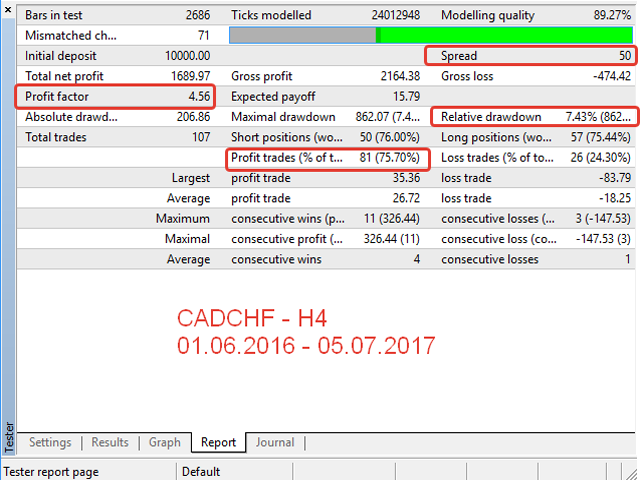 Take profit - target profit value. Indicates in points for four decimal places. For five decimal places, it is automatically calculated. slippage - slippage when opening orders. Indicates in points for four decimal places. For five decimal places, it is automatically calculated. 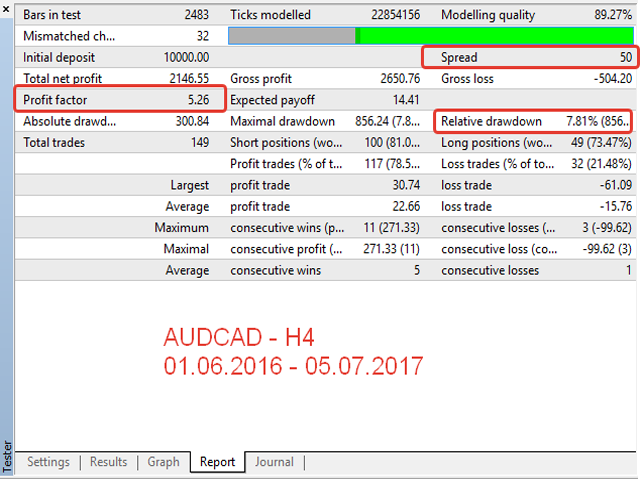 maxSpread - max spread allowed to trade. If the current symbol spread exceeds the specified one, the order will not be opened. Indicates in points for four decimal places. For five decimal places, it is automatically calculated. Allowed open orders - the number of orders that can be open on the account. If more orders are open on the account, no new orders will be opened on other symbols. If 0, the function is disabled. fix_BALANS - deposit value in $. This amount is used for the calculation of profit % for averaging, lot value, as well as maximum drawdown. If 0, the calculation is made based on the current balance. maxLossEA - maximum allowable drawdown on the symbol. Specified as a percentage. If 0, the function is disabled. panel - true/false. Show/hide information panel. Col_info - the color of the info panel. Time_Start - trading start time. Time_End - trading end time. Optimized the code. Fix minor bugs.